The question with a collaborative project like this is always the same, and that is this. Will the music survive the egos involved? After all, the word “supergroup” has been used, and rightly so. Luckily, it seems like this issue wasn’t exactly lost on the three principles. And the proof is in the pudding. So, what kind of dish are we looking at, exactly? One thing this concoction isn’t is a rock oriented punk rock girl group style sound, which is what was envisioned when the three artists initially got together. Part of the reason for knowing this was a process that seemed to suggest itself to them when they finally came together to write. This led the way into a chamber folk-pop space with a sort of partially sunny, partially cloudy atmosphere. All they had to do was follow it. The first thing to notice here is the voices, which is of surprise to absolutely no one. All three are powerfully gifted in that department, although in different ways. And really, this is what we’ve come for, right? And yet, the pull to do layer upon layer of three part singing is resisted. It feels like this is a song written by three people who are still looking to be surprised by what comes out of them when plunked down as they are here in a new artistic context, wanting to present that sense of surprise to listeners instead of reaching for the obvious. There is a bold generosity that can be found in an approach like that, because it’s harder to achieve. This approach ends up giving us what we’re looking for, and yet undercutting our expectations at the same time. I think that’s another issue with supergroups that make them challenging prospects for artists who are used to calling the shots on their own. We as their fans want to hear the individual musical signatures of everyone involved. But, we want to hear how each one of them is challenged by the presence of the others, too. It’s a delicate balance. Here on this song, they sound like the mythical three sisters of fate singing together, with Case’s voice in the middle, flanked by Lang and Veirs on either side, not getting in each other’s way, and not undone by any overwrought vocal arrangements. This is a subtle play that comes out of remembering that the song should always lead, and that the voices involved should always buoy it up, not the other way around. No one is fighting for the microphone here, not when it’s been decided that it’s what the song itself demands that is the guiding star by which the music is created and presented. For artists of this calibre, the call to make a great record is stronger than the one to be in the spotlight. And I think that’s what we’ve got on our hands here. 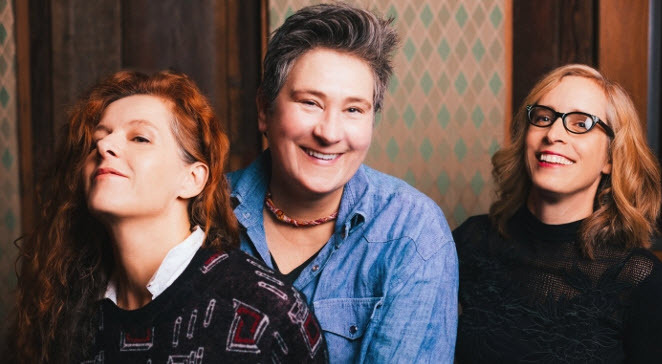 Case/Lang/Veirs are going on tour. You can find out if your local music venue is on the list very simply by navigating directly to caselangveirs.com. From there, you can also hear yet another cut from the upcoming album, called “Best Kept Secret”. And for more about how these three songwriting mavens got together to begin with, what they make of all of this “supergroup” talk anyway, and more about how they approached the business of making a record together, take a read of this interview from lennyletter.com. All great talents here but for me the sum didn’t surpass the merits of the parts. Neko Case is a fine writer and performer but always seems to want to boost that echo slider well past midway on her recordings – seems like she prevailed here as well. The other two youtubes feature lang and Veirs up front. I could see Brian Wilson launching legal action over “Honey and Smoke” – right out of “Pet Sounds” but just two-thirds the imagination. “Best Kept Secret” (Veirs) borrows a lot of cheesy strings from Burt Bacharach, but Charlotte Cornfield has several better tunes, if you ask me. Which you didn’t, but I’m always pleased to tout Charlotte – herself a bit of a best kept secret, unfortunately. I don’t begrudge ClV the success it will likely earn – it’s good stuff, as you’d expect, but a good bet less than I would have expected. If their tour came round to the Wilno Tavern I’d be sure to go, but trucking down to Toronto mid-August doesn’t seem like a lot of fun. The jury for me will be out until I hear the whole record. But, until then it’s horses for courses, I suppose. And did you mention Charlotte Cornfield? Well, I got to interview her a few years ago, which you can read about right here. Thanks for comments as usual FLF!